Error 923 is shown by the Google Play Store of Android devices when there is an issue downloading a new app or upgrading the one that is already installed on your phone. Users facing this problem can simply make it go away by clearing the cache and data of the Play Store in their Android device. 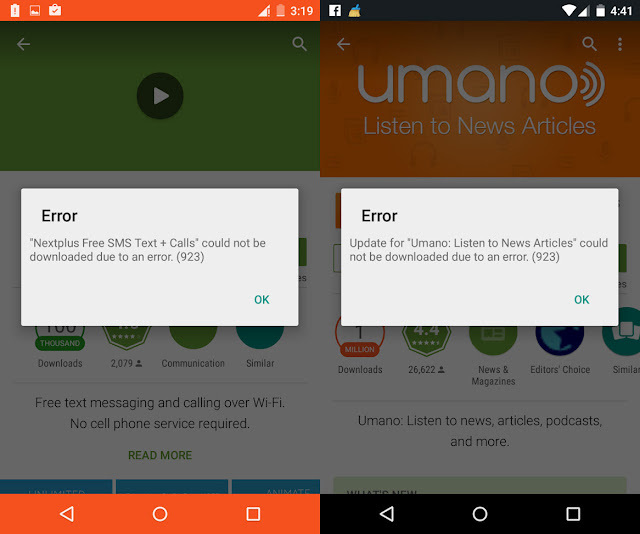 The message that is displayed by the device goes something like, “Error ‘app’ could not be downloaded due to an error. (923)” or "Update for 'app' could not be downloaded due to an error. (923)". Of course, the ‘app’ can be any application on your smartphone. Under Device, tap on Apps. Click on Clear Data and Clear Cache buttons and confirm your action. I got this error when my Wi-Fi connection was having problems. So you can try disabling and enabling Wi-Fi. Some people have found that turning on the airplane mode on and off helps. If you find that you still get this error while downloading/upgrading apps, you can try it in other Wi-Fi networks and hotspots other than yours. But if you keep getting this error then, you can try other guaranteed methods like wiping cache partition or even factory resetting your phone. Those will remove everything from your phone.